A new branch of Dosa Plaza opened recently in Preston, right on the junction, just near the Aldi supermarket. Dosa Plaza is a franchise with a handful of stores around Australia and New Zealand as well as over fifty in India. I wouldn’t normally give a franchised restaurant a second look, but I had been watching the store being built over the last few weeks. What caught my eye was the fact that they were entirely vegetarian. A quick look at the website and I found that they had a large number of vegan menu items as well. So I decided I wouldn’t be a snob and give them a try. The menu runs the gamut from Italian pasta to a variety of Indian and Asian food ranging from street style snacks to full meals. It also has an astonishing array of what could be described as cross-cultural dosas, from Mexican to Chinese. For my first try, I stuck to straight Indian flavours. I chose some pani puri with a potato filling and two sauces as well as a dosa with a vegetable and lentil soup and some coconut chutney. Both were delicious. 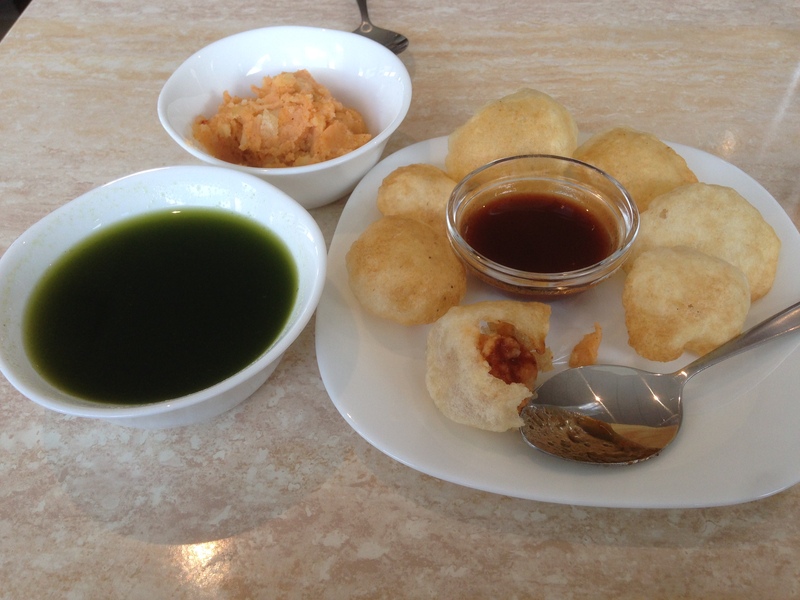 I love food that requires assembly at the table and the pani puri satisfied my love of playing with my food. Pani puri are small crispy hollow puffs. You crack a hole in the top, fill with some potato and spoon on some of the tart tamarind sauce and fill with the green chilli sauce. Then eat them whole before they go soft. The experience is great. The crispy outside explodes in your mouth to release the soft filling and the sauces. The staff were a bit worried when I ordered them, they told me the green chilli sauce was quite hot. I decided I’d be brave, but I was a bit worried it would be diabolical. When an Indian person tells you something is hot, it is possibly a good idea to take note. In fact I need not have worried, it was just the right amount of heat for me. There was quite a large bowl of the green chilli sauce, they told me that they drink the leftovers. I didn’t. As a sauce it was great, as a soup it would have been a bit too much. I also enjoyed the dosa and soup and chutney, though next time I will probably go for a filled dosa. All in all a very nice surprise. That all looks great! I must try to head over this summer.